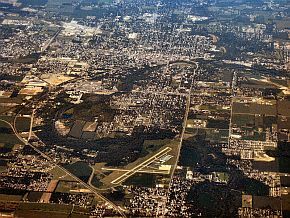 Anderson is a city in southwest Indiana encompassing approximately 40 square miles with a population just over 56,000. It is located northeast of Indianapolis and is the seat of Madison County. In 2007, Anderson placed 98th in Forbes list of 100 Best Places To Live. The economy has suffered comparably to other U.S. cities due to the recession, particularly since the closing of the GM plant in 2006. Still, the manufacturing and trade sectors are the largest in the local economy. Currently, the city is also home to Northwind Electronics, ERTL Enterprises and ERTL Fabricating, which present promising employment opportunities for the local community. There are a number of other prominent employers in the Anderson area, including the city and county governments as well as a number of recreation-based companies. The area is home to the historic Paramount Theater as well as several large hotels and parks. The medical industry also has a holding in the area, with nurses, pharmacists, health services managers and other related workers comprising a large sector of the population with college degrees. Additional information on the local economy and key employers... Wikipedia: Anderson IN Economy.